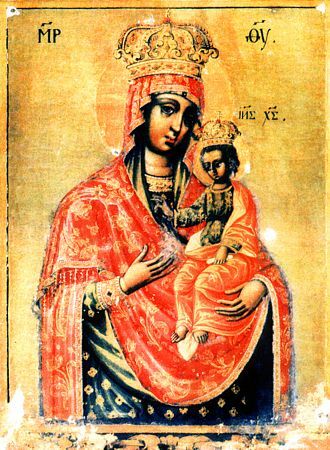 The Il'insk-Chernigov Icon of the Mother of God was written in the year 1658 by the iconographer Grigorii Konstantinovich Dubensky, – in monasticism Gennadii. In 1662 over the course of 8 days, from 16 to 24 April, tears flowed from the icon. In this same year Tatars descended upon Chernigov and devastated it. At midnight they burst into the Trinity monastery, went into the church, overturned all the icons and grabbed all the utensils, – but the wonderworking icon with its adornment remained untouched. An invisible power held back the impious from the holy icon. The Queen of Heaven likewise once had not permitted, that the enemy should enter into the cave of the Monk Antonii of Pechersk, where the brethren of the monastery had hidden. As though terrified by an incomprehensible vision, the Tatars turned to flight. The miracle of the Mother of God from Her Chernigov Icon was described by Sainted Dimitrii of Rostov (Comm. 28 October and 21 September), in his book, "The Moistened Fleece" ("Runo Oroshennoe"). Later on Sainted John of Tobol'sk (+ 1715, Comm. 10 June) also wrote about the Chernigov Icon. A wonderworking copy of the Chernigov Icon of the Mother of God, situated in the Gethsemane skete-hermitage of the Trinity-Sergiev Lavra, was glorified in the year 1869 (account is under 1 September).